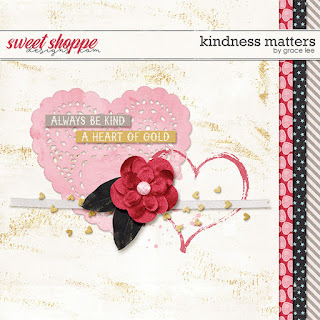 February is Sweet Shoppe Designs' birthday month, and we'll be celebrating all month long! There will be new releases, storewide sales, free-with-purchases, and yes, even new freebies from the designers! You won't want to miss any of it. Sign up to my newsletter here! You have come from KimB Designs and your next stop is Studio Basic Designs! This freebie will only be available until the end of this month, so be sure to grab it and unzip it to make sure it's downloaded properly! Thank you so much for sharing the wonderful kit. Marie H.
Thank you for the adorable template. Marie H.
Thank you so much for your generosity. I love the theme and the colors of this collab. I love hearts, and both your lace heart and your open heart are especially pretty. Thank you! Such a pretty flower! Thank you - I love hearts anything, any time of year. Beautiful! Thanks for taking part in the parade & sharing your creation! This is beautiful - thank you so much for your generosity! The colors are beautiful!!! Love both of the hearts!!! They are charming!!! The flower and word art are delightful!!! The papers are gorgeous!!! Thank you so much for sharing!!! Lovely contribution! That white & gold paper is amazing! Thank you for your hard work and generosity! Thank you so much. I signed up for your newsletter. Should be fun seeing all of your designs.